Veterinary officers, animal health experts and scientists from 12 countries in the Asian region converged in Colombo to renew commitments and take action against any possible outbreak of the rinderpest, a highly contagious disease that, throughout history, has killed millions of livestock. 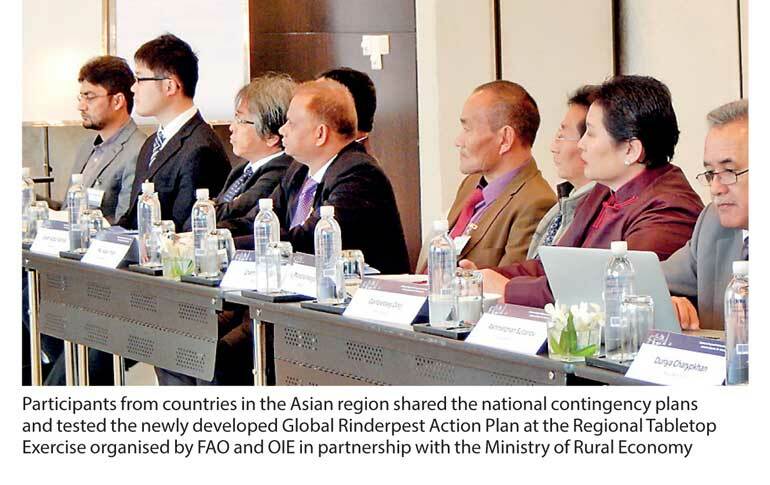 Over 30 experts attended a Rinderpest Tabletop Exercise conducted by the Food and Agriculture Organization of the United Nations (FAO) and the World Organisation for Animal Health (OIE) in partnership with the Ministry of Rural Economy of Sri Lanka. The exercise focused on detection and responding to a simulated scenario of a rinderpest outbreak in Asia, the sharing of national contingency plans, and testing the newly developed Global Rinderpest Action Plan for national, regional and international coordination for a potential rinderpest emergency. The second disease to be eradicated globally after smallpox, rinderpest is also the first animal disease to be eradicated. However, since stocks of the rinderpest virus are present in several laboratories, the destruction of the virus or their secure transfer (sequestration) to FAO-OIE approved Rinderpest Holding Facilities are encouraged. Furthermore, a Global Rinderpest Action Plan was introduced to ensure continued global freedom from rinderpest by outlining the actions necessary to prepare, prevent, respond, and recover from a rinderpest outbreak. The Regional Rinderpest Tabletop Exercise held in Colombo, which followed a similar Exercise for the East Africa region in Nairobi, Kenya saw countries working to improve and harmonise national and regional contingency plans to the GRAP. Senior Animal Health Officer, Rinderpest Co-secretariat from the Animal Production and Health Division, FAO Headquarters in Rome Dr. Samia Metwally stated that the most important finding from the tabletop exercise was that countries don’t remember rinderpest and what the disease looks like. “So in case of a re-emergence, the detection of this disease in the Asian region may take a long time, and it will be too late to control it,” she noted. Dr. Metwally also said that most countries were against slaughtering vaccinated animals to gain disease freedom, if rinderpest is re-introduced. Discussion surrounding the current OIE Terrestrial Code for the recovery of freedom from rinderpest highlighted that recovery can be achieved without slaughtering of vaccinated animals. Dr. Mariana Marrana, Chargée de Mission of OIE stated that the OIE Terrestrial Code can be reviewed upon request from the Membership. “Should there be any accidental escape of the virus, or re-emergence of the disease there needs to be adequate surveillance systems in operation and continuous vigilance maintained, enabling the disease to be detected early and managed promptly,” said Renuka Ekanayake, Secretary of the Ministry of Rural Economy, Sri Lanka. She reiterated that every country and region should have their contingency plans tested by simulated scenarios and tabletop exercises. It was also noted that Sri Lanka had experienced the impacts of rinderpest on livelihood and food security during wars and the importation of cattle. The last case of rinderpest was in 1987 and Sri Lanka declared freedom of the disease in 1994. Human population is expected to rise to 9.6 billion by 2050, and many of these people are expected to live in urban and peri-urban areas. With rising urbanisation and rising incomes, food consumption patterns are likely to change and the demand for livestock products will rise. “Currently livestock contributes 43% of world agricultural GDP and its value exceeds 740 billion dollars [USD],” said Brandstrup. “This creates an income opportunity for producers, not least for poor producers. But for them to benefit, their investment in production must be protected,” she added. Taking all possible measures to prevent high impact transboundary animal diseases such as rinderpest from re-emerging, will ensure improved global food security, strengthen household economies and increase livestock investor confidence and livestock trade.